Tennis Tayside are the managing authority for Lawn Tennis in the Fife, Dundee & Perthshire area. They help clubs in their area communicate and collaborate and compete – organising tournaments and leagues and publicising relevant events. The concept we came up with was to provide a hub of useful information to existing clubs and also players looking for a club or place to play. With many Tennis facilities being based outside, and the area covered being subject to the usual changeable weather experienced in Scotland, the Tennis Tayside committee thought it would be good to give some idea of weather at the various clubs they support. Using a feed of UK Met Office data, we created a rain radar map, that shows observed or forecast rain for a specific location. 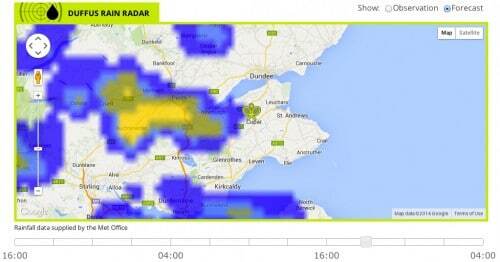 Every club has their own page on the website, with a rain radar map centered on their location. 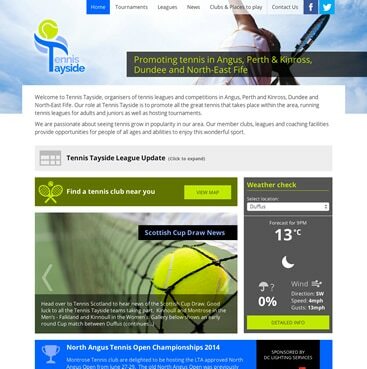 League results and positions are one of the key things the Tennis Tayside audience are interested in, so we added a widget to display league summary information on the homepage, where visitors can expand the information and drill down to the full league pages if they want more detail. Social Media was an area that Tennis Tayside knew they needed to embrace if they were to stay relevant and connected to many of their member clubs. They resurrected dormant social media accounts, and we helped them bring everything together by including a social media wall on the homepage showing their latest Facebook and Twitter posts. When the site launched the feedback was positive, with some clubs even giving them kudos on social media – mission accomplished!